Saturday December 21st 1907 I had baking and sweeping to do this morning. Will went down town at 12.37 and I an hour later. I spent the afternoon with Mrs. Brown and Miss Place from [Deloran?]. The streets were crowded with people shopping. It was a beautiful day. I had a lot of work to do in the evening. Sunday December 22 1907 I was busy with the work all morning I got up a nice dinner. Mrs Brown & Miss Place came out at 11.20 and John and hour later. Ott, Fannie & Hattie in the buggy We had a most delightful days visit. The Baby was too [Dear?] for [any use?]. Soon after they all started home it set in to rain. I did up the work and felt I had had a delightful day. I wrote some in the evening. 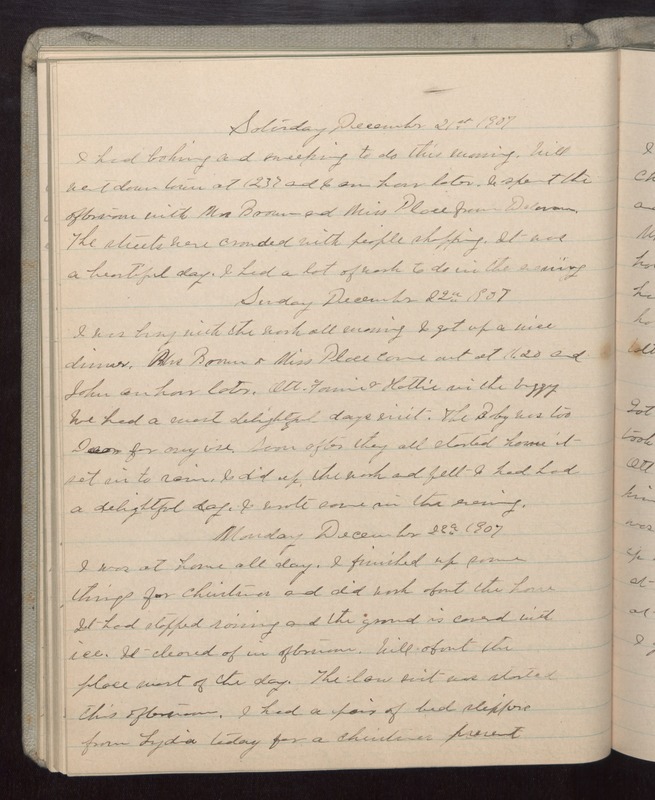 Monday December 23 1907 I was at home all day. I finished up some things for Christmas and did work about the house. It had stopped raining and the ground is covered with ice. It cleared of in afternoon. Will about the place most of the day. The law suit was started this afternoon. I had a pair of bed slippers from Lydia today for a Christmas present.